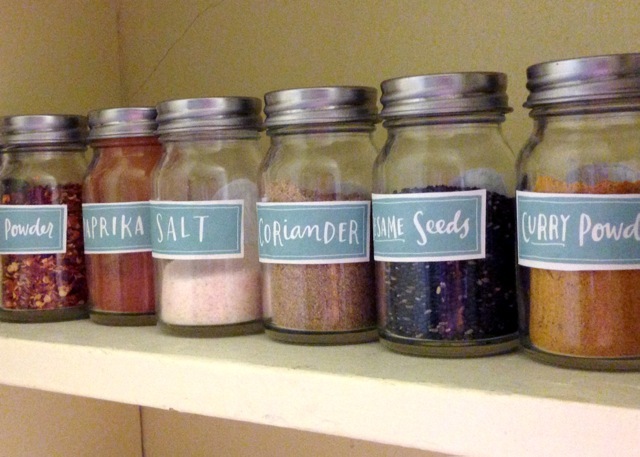 Pantry Kitchen & Spice Jar Labels for your Spring redo! At Lia Griffith HQ they have been having a much needed spring clean. 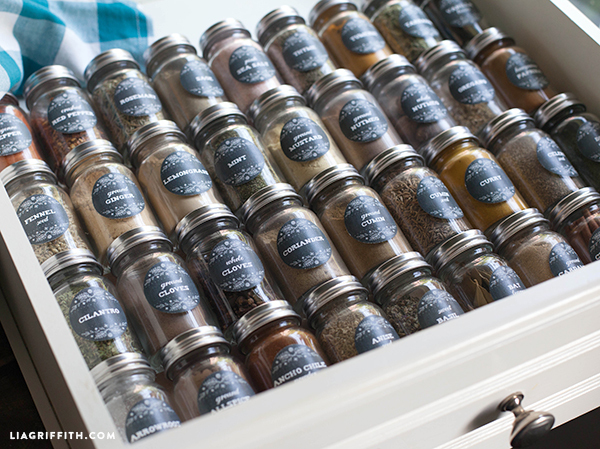 Decanting your kitchen foods into glass jars and labelling them is the perfect way to sort a disorganized kitchen and have it looking beautiful and functional all at the same time. 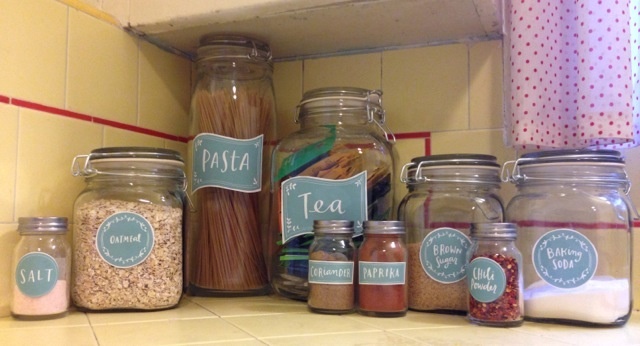 These pantry labels and spice jar labels are perfect for organizing your dry produce and spices. They come in two different designs – one a modern, floral, Scandinavian inspired design, the other a simple, elegant design inspired by 1940’s signage. Download the font (included below) before downloading the labels below so that you can easily alter the text to suit your needs. All these labels are printed on our full sheet labels and are then trimmed using a variety of circular, oval and corner punches. 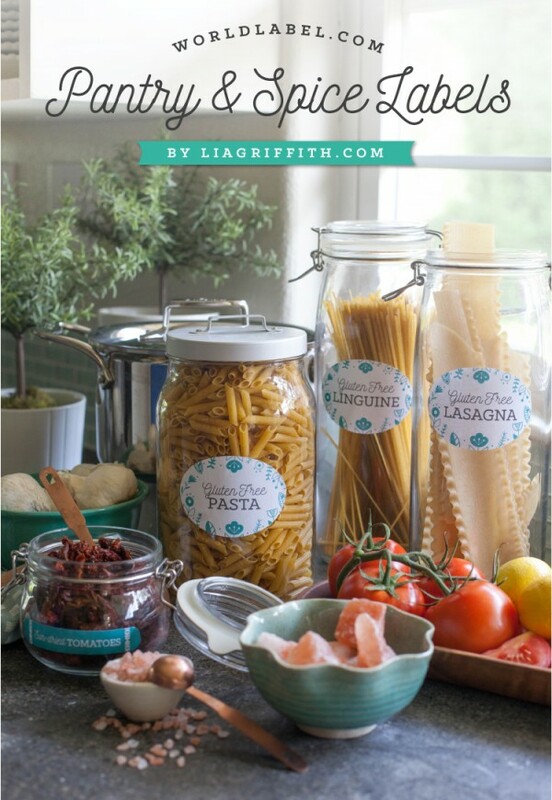 For more details and a look at Lia’s kitchen pantry in more detail head on over to her website today liagriffith.com. 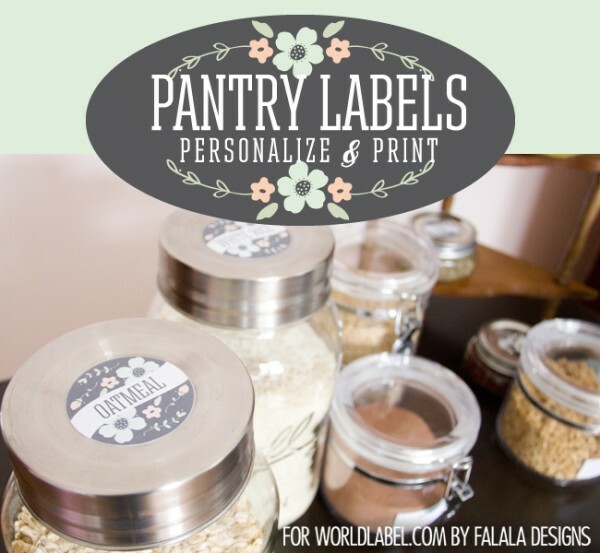 This entry was posted in Labels & Printing and tagged free pantry labels, free printable labels, kitchen labels, pantry label templates, spice jar label templates, spice jar labels on May 5, 2015 by wlmanager. Spring is a great time to give your kitchen a little facelift. To coordinate your herb and spice jars with your Vintage Farmhouse Pantry, here are the matching labels in both chalkboard and kraft design. 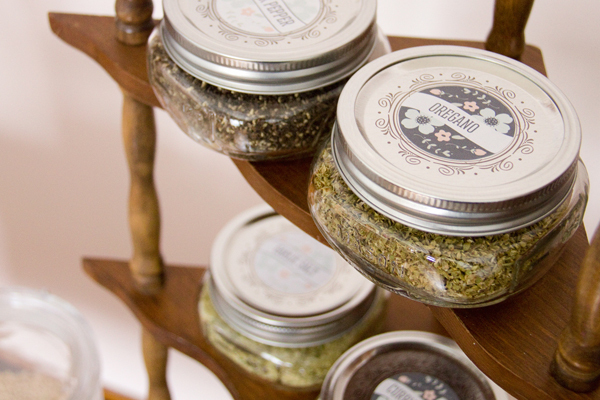 Designed by Lia of liagriffith.com, the round 1.5 inch labels fit perfectly onto your spice jars and lids. 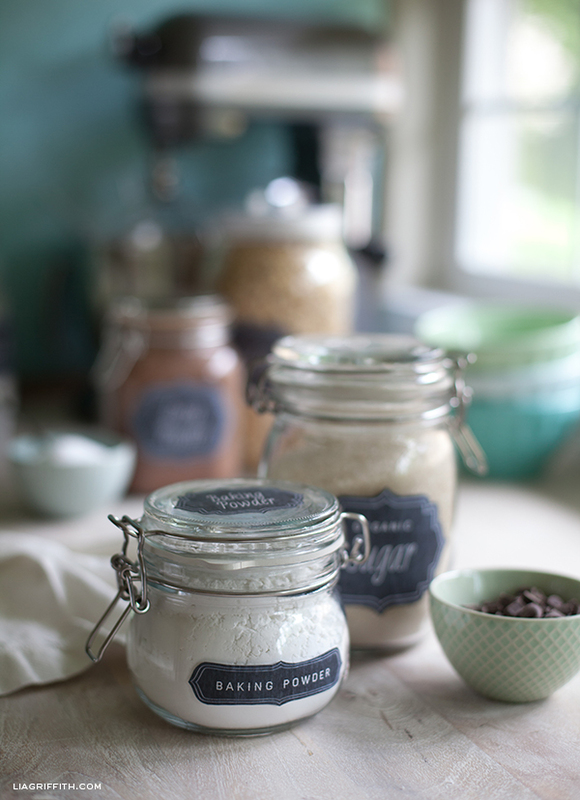 To use these labels, you will want to download and install the free farmhouse style fonts. Download and open your label PDF in Adobe Acrobat where you can select and replace the placeholder copy. There are three pages of labels offering you the script/block, block/script and block type. This will give you the variations you will need for most herb and spice labels. Print your PDFs onto full sheet label paper and use a 1.5 inch round circle punch to trim. You can print two sets and use one for the jar and the other to top the lid. 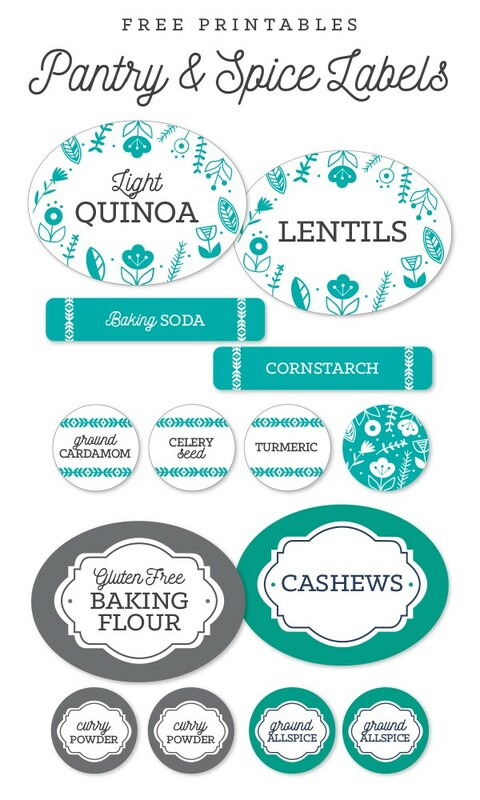 For your matching Farmhouse Pantry Labels, visit this post. This entry was posted in Label Design, Labels & Printing and tagged free label templates, kitchen labels, printable labels, spice jar label templates, spice jar labels on April 29, 2014 by wlmanager. It is that time of year to do a little spring cleaning and maybe even organize your pantry. To help you organize and add a farm fresh look, we have two versions of Farmhouse Pantry Labels for you to choose from. 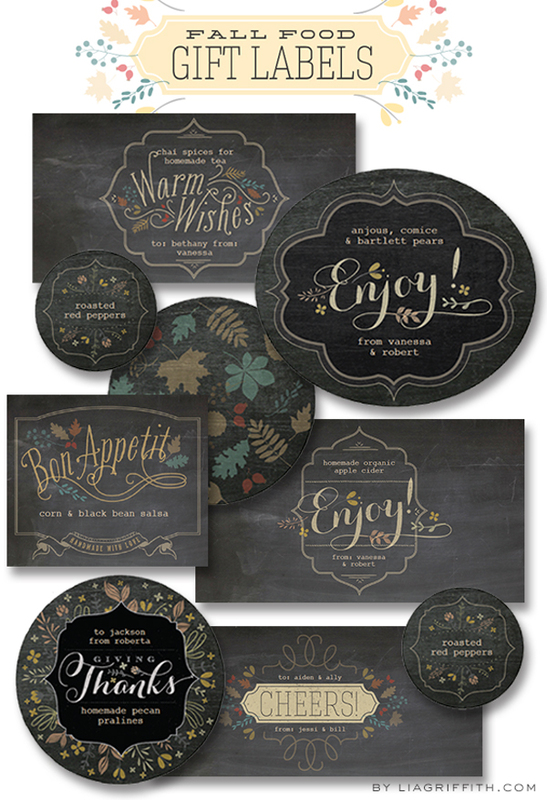 You can pick the ever popular chalkboard style or the vintage kraft paper style and maybe even use both! 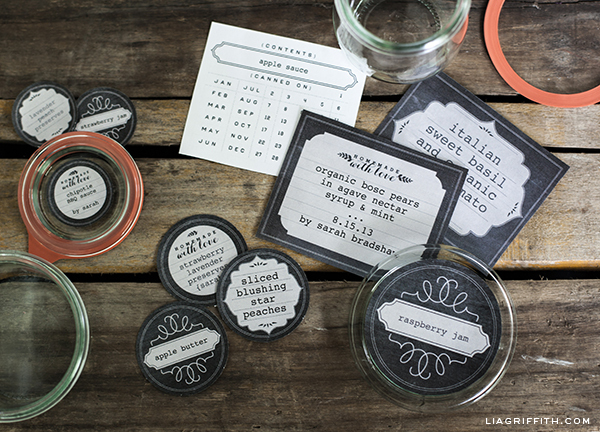 These label, designed by Lia of liagriffith.com, are ready for you to add in your own text. Simply install these two free farmhouse style fonts then download your labels PDFs onto your desktop. Open them in Adobe Acrobat where you can click onto the text fields and type your text. These labels have three versions of each style; script/block, block/script and block. 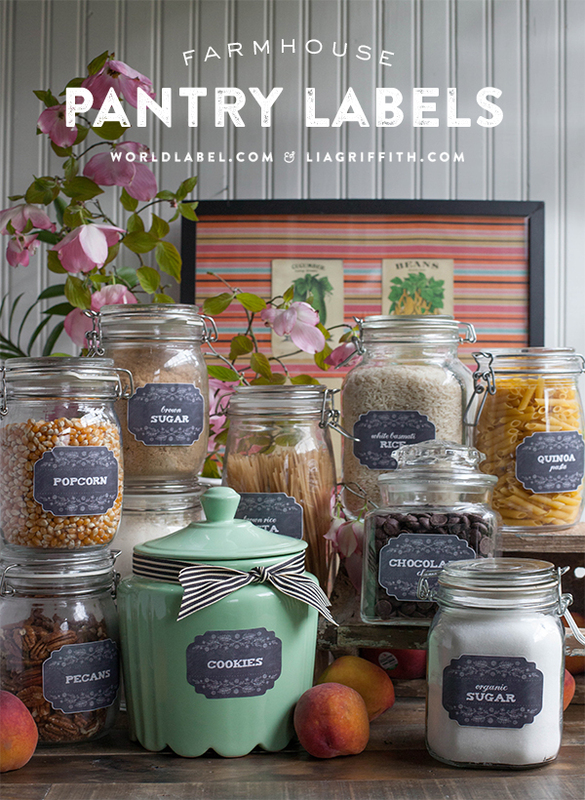 This should give you enough variations for every pantry label you will need. Once you have your designs ready, print onto a full sheet label paper and trim the labels. Since these are vintage style, a less than perfect trim gives it an authentic touch. 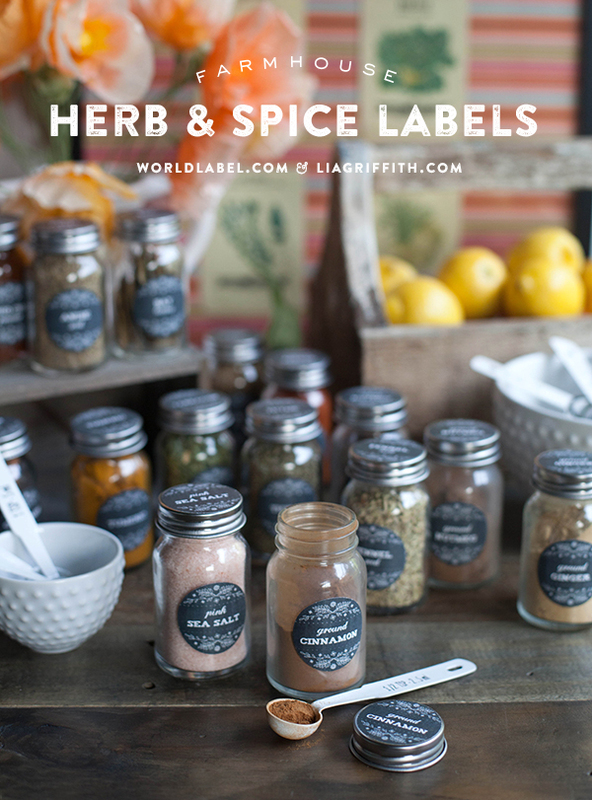 Stay tuned for the coordinating herb and spice jar labels coming soon! 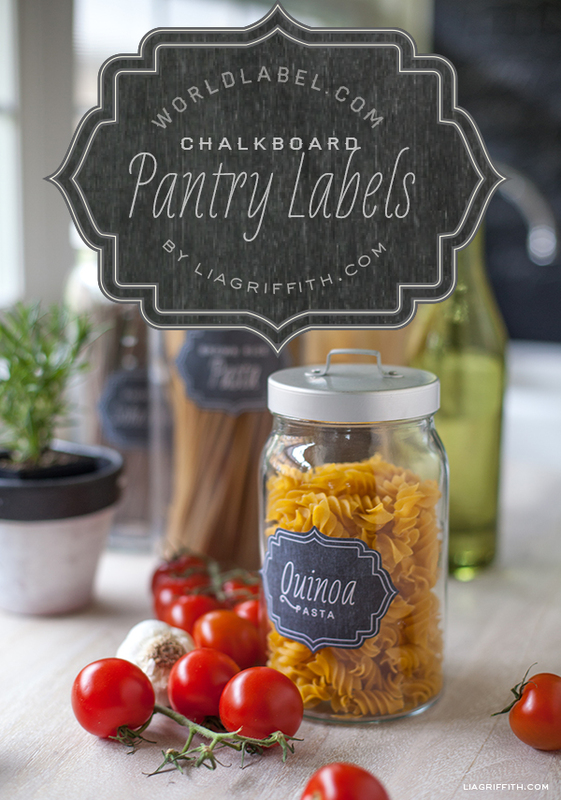 This entry was posted in Label Design, Uncategorized and tagged chalkboard labels, country labels, free label printables, free label templates, free pantry labels, kitchen labels, kraft labels, pantry labels, printable labels labelprintables on April 23, 2014 by wlmanager. This is the time of year for gatherings and dinners with friends and family and it is the time of harvest. Food gifts, either homemade or purchased, are perfect for the hostess gift, a fall birthday or as an added treat for the Thanksgiving feast. To help you personalize and package your fall food gifts, Lia of liagriffith.com has designed this set of chalkboard style labels for both food and beverage gifts. These can be easily personalized when you open the free PDF download, then printed onto a full sheet label paper. Lia shares some ideas for finishing with ribbons or twine in her photos below so that you can have that perfect personalized gifts this fall season. Labels are ready to be personalized and are in editable PDF templates. We suggest printing on our full sheet labels and cutting out the designs! This entry was posted in Label Design, Labels & Printing and tagged chalkboard labels, food gift labels, free holiday labels, free label printables, free label templates, free printable labels, holiday labels, kitchen labels, label printables, pantry labels on October 15, 2013 by wlmanager. 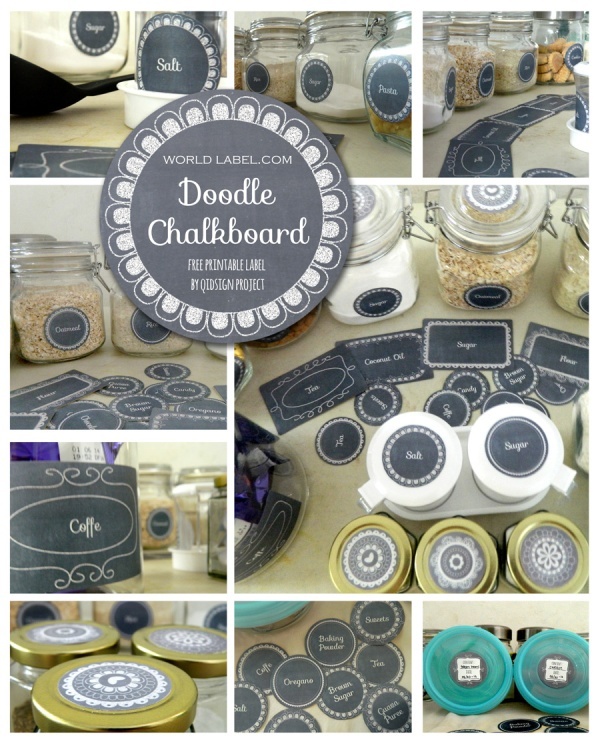 This entry was posted in Label Design, Labels & Printing and tagged chalkboard labels, free label templates, free labels, free printable labels, kitchen labels, pantry labels, printable labels on October 2, 2013 by wlmanager. Use Worldlabel.com adhesive label products to label your canning jars. One can always use our Full Sheet Label and cut out the designs. 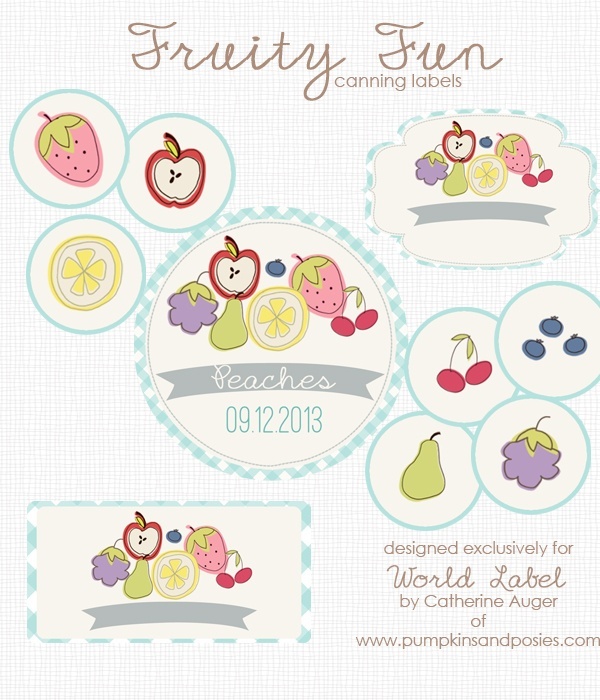 This entry was posted in Label Design, Labels & Printing and tagged canning label templates, canning labels, food labels, free label templates, free printable labels, kitchen labels, printable labels on September 28, 2013 by wlmanager. Summer has finally began and before we can blink, it will be canning and freezing season. 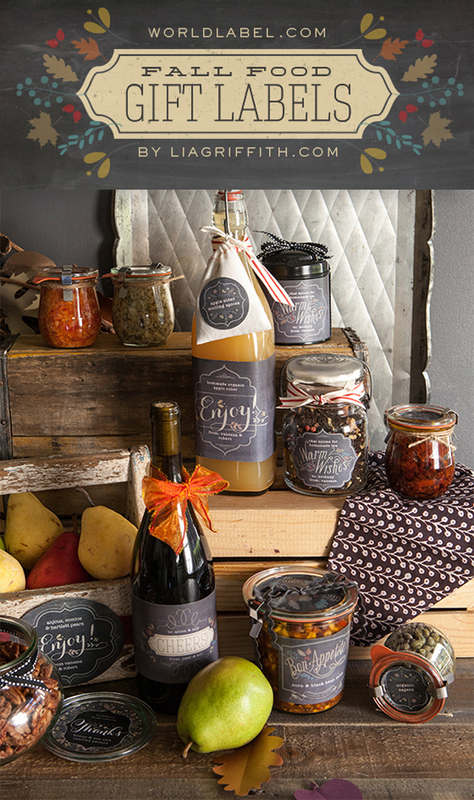 We want you to preserve your food in style, making these home prepared goodies an easy gift throughout the year. 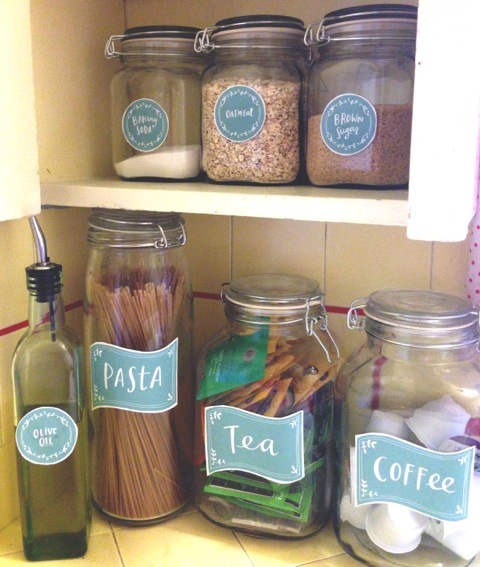 The labels also help you to stay organized on your pantry shelves and in your freezer. 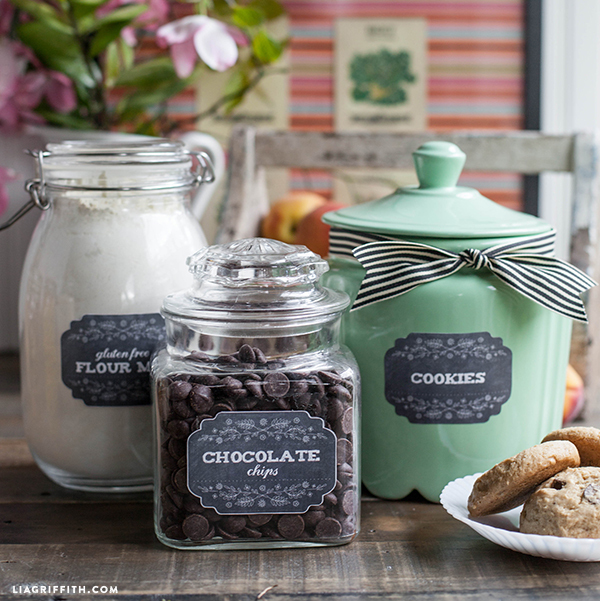 Using the trendy vintage chalkboard style for the canning labels, the printables include a date label, three styles of large jar labels, three versions of 2 inch and 1.5 inch lid labels with an area to or a pretty decorative label to finish the look. The dated freezer labels allow you to know when they were preserved from fresh to frozen. 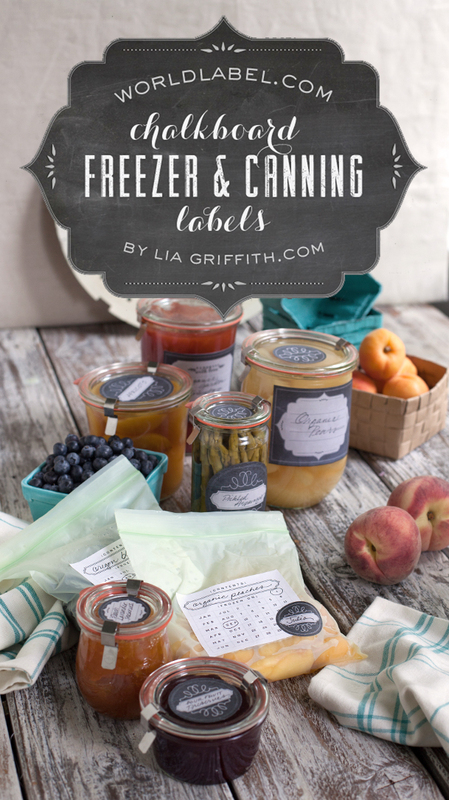 Designed by Lia Griffith of liagriffith.com, these labels are ready to print, trim and apply to all of your canning jars, canning lids and freezer bags. 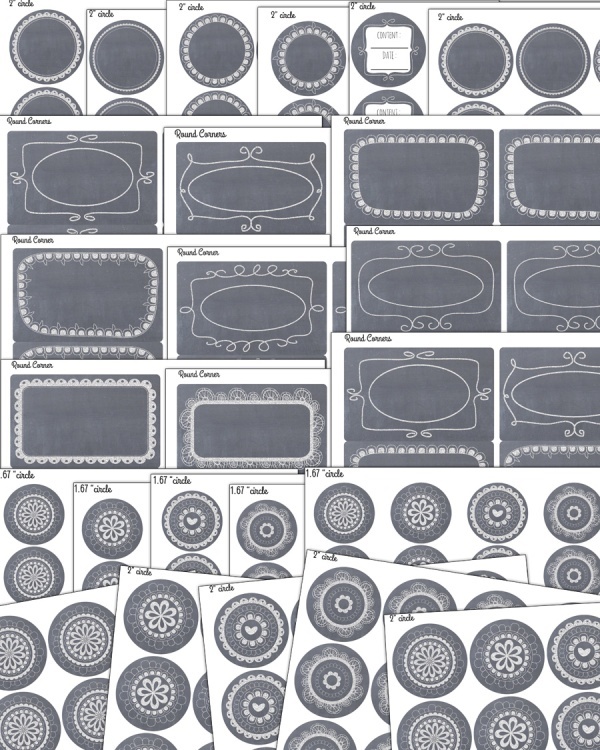 All of these designs can be printed onto worldlabel.com full sheet labels. For the Freezer labels, please see bellow 10 full sheet labels with an aggresive freezer adhesive for $12.45 The round labels are easily trimmed with a 2 inch or 1.5 inch punch. One tip Lia suggests is before you begin to trim the round labels is to peel and replace the backer so it will come off easily once you have cut your circles. 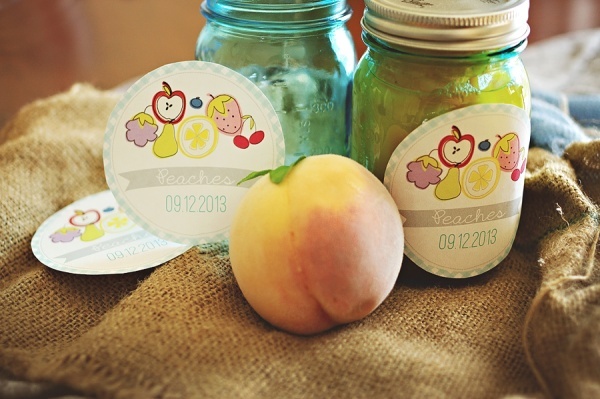 This entry was posted in Label Design, Labels & Printing and tagged canning label templates, canning labels, free label templates, free labels, free printable labels, freezer labels, jar labels, kitchen labels, labels, pantry labels, printable labels on June 25, 2013 by wlmanager. These kitchen organizing labels for your pantry and spice jar containers and canisters are designed by Emily McDowell, a illustrator, designer and truth-teller. Emily also has an Etsy Shop you should check out to see more of her great illustrations. There are two types of labels offered. One has words on them with an awesome font designed by Emily on them and ready for you to print -:) Then we have blank labels with a default chalkboard font installed ready for you to choose which ever words yout want on the labels. This font can be changed: type, size or color, (as well as bold, italics, etc.) select Control +E if you’re using a PC or Command + E on a Mac. A toolbar will appear giving you additional text properties. Select “More” in the font properties toolbar for paragraph alignment and more. To Print: we suggest using our full sheet labels and cutting the labels design out for perfect alignment. You can use a round hole punch for the round labels and/or for the larger round labels use WL-5375 and for the smaller round labels use WL-2088. Please note: These labels were individually hand-painted by Emily McDowell as a special commissioned project for WorldLabel, and this lettering style is not available as a font. This entry was posted in Label Design, Labels & Printing and tagged free label printables, free label templates, free labels, kitchen labels, label design, labels, pantry labels, spice jar label templates, spice jar labels on March 19, 2013 by wlmanager.